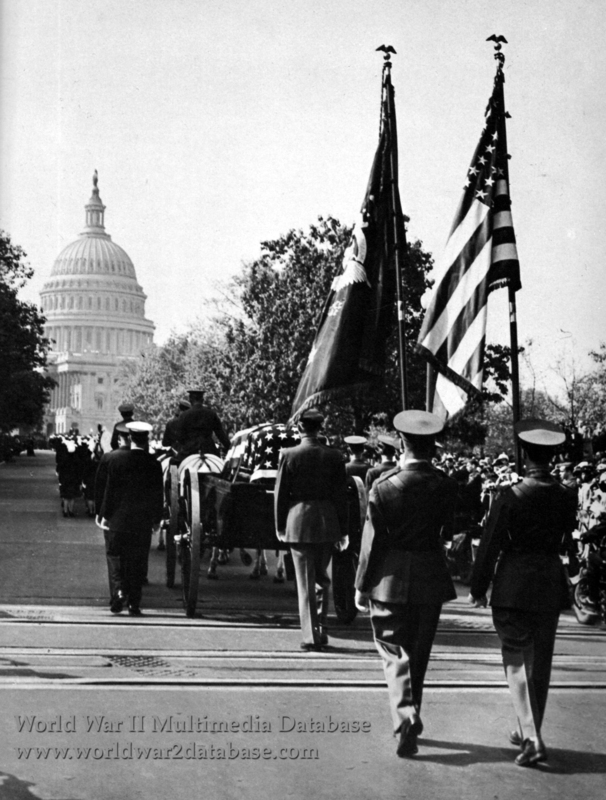 United States President Franklin D. Roosevelt's funeral procession proceeds up Delaware Avenue at 1000 Hours, towards the Capitol past the Russell Senate Office Building on its way from Union Station to the White House for the first private memorial service. The procession consisted of motorcycle police, followed by mechanized armor and truck-borne infantry, the United States Marine Band, Annapolis cadets, the United States Navy Band, Women's Army Corps (WACs), Women Accepted for Volunteer Emergency Service (Navy WAVEs), United States Coast Guard Women's Reserve (SPARS), then the caisson itself. The coffin was draped with an American flag; the caisson was covered in black. Six white horses pulled the caisson, accompanied by uniformed representatives of all the Armed Services. A riderless horse, stirrups reversed, followed the caisson. The crowd fell silent as the caisson passed, the horses' hooves the only sound until the sky was filled with twenty-four Consolidated Liberator heavy bombers. Former First Lady Eleanor Roosevelt came next in a closed car, followed by President Harry S Truman. The cortege reached the White House about 1130 Hours, and a private funeral service was held at 1600.